I have always heard of Gymboree, but never actually purchased anything from them. I thought their clothes seemed a tad bit pricey for me. Kids grow so fast. But now that I've had a chance to try them I'm smacking and kicking myself. Truly!! We received a gift card from Gymboree so we could shop and get what we wanted! Some of the items we got were the Ladybug Daydreamer 2 piece Gymmies, Gem Dolphin Tee with the Embroidered Cuff Jean Short for Avery And a SUPER adorable romper. For Emerson the Toucan Tours Tee with the Stripe Knit Short. 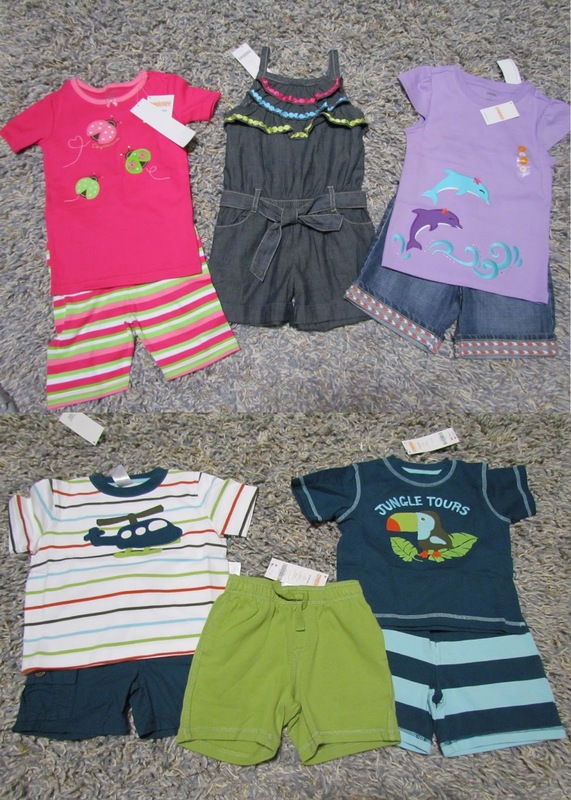 Also the Teal Cargo Short with the adorable Helicopter Tee and also the Green Terry Shorts that match either shirt. Emerson got his clothes in a 12-18m size. I find that their clothes are pretty true to size or run a TAD big. Avery got 6's and she fits in her clothes pretty well with a bit of room to grow. I just LOVE her dolphin tee and I adore those shorts because of their length. I hate when little girls shorts are super short. These have the perfect length to them and it makes them school appropriate too! Gymboree's clothes are super soft, made of great quality and are super adorable! They come out with new collections all the time and they make it easy to match clothes together. This trip was about $106. But since I spent $100 I got a Gymbucks coupon to use next time. It was $50 off when I spent $100. So that's a 50% discount!!! I used that coupon TODAY plus the remaining $18.57 that was on my gift card from the last trip. My lighting in my living room isn't that great! For next summer Avery got the Sequin Flower Chambray Top and also a Pink top from the same collection in a size 7. And Emerson got the Tree Frog Tee, Pocket Polo Shirt, and Brown Cargo Short. He also got a Dog Tank. All in a size 2T. For Back To School Avery got the Gem Meow Kitty Tee, Sequin Apple Tee and the Gem Button Long Sleeve Tee all in a 6. This trip came to $100 and some change. After my $50 Gymbucks and $18.57 in gift card I paid just $34.75 for all of the above!!! Talk about a STEAL! I'm all about using coupons so the Gymbucks are truly right up my alley. I can't wait to shop there once I know the gender of this little baby. Their quality is great, The sales associates in the store are amazing and super helpful. And they have pretty good stock of sizes in the store as well. I did go in for this top but they didn't have her size. That was the only thing I noticed they were out of in her size. The kids clothes have been washed many times so far and I haven't had any issue with shrinking, loose threads or anything else. They have just been wonderful. Price: They have a LOT of clearance going on right now. 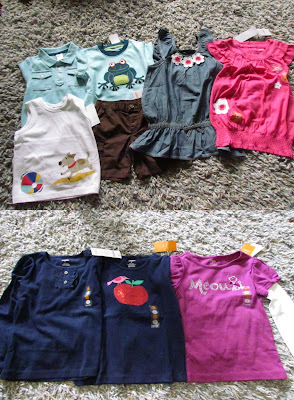 Avery's Meow and Apple top were $19.99 each full price. Which still isn't too bad. For the Off to School We Go hop, Gymboree is offering one reader the chance to win $100 certificate in the Grand Prize giveaway!